Five years ago, after George W. Bush left the White House to pursue a second career in bathtub self-portraits and a young Senator named Barack Obama defied predictions and convention to be sworn in as America’s 44th President, PlanetPOV began it’s orbit. Kalima, KQuark and me met as bloggers at Huffington Post and as its character changed, we imagined a home for bloggers that echoed what we enjoyed of the early HP, the sense of community, the freedom of expression and the informed, conscientious and wit-filled conversations. To that, we added our own sensibilities of what an ideal site for bloggers should include, an adamant respect for freedom of speech, spotlighting real people with real opinions and insisting on a modicum of respect for all. Along the way, we and our fellow members added unique features to PlanetPOV and continue to keep The Planet spinning in fresh ways. We’ve upgraded our server and our software in an ongoing commitment to keep PlanetPOV speeding along. We are an all volunteer site, all the work you see our Admins doing here (and a lot more you don’t see behind the scenes) are provided purely as dedication to the community here and all that The Planet represents. PlanetPOV doesn’t accept the typical advertising that you see at many other sites because some of it would conflict with our principles and those of our members (no doubt you’ve seen pro-Right Wing ads on HP and other sites not perceived as Right Wing sites). So, the way we pay our bills is primarily through your kind donations. As part of our celebration of five years of providing a platform for real people to speak truth to power and express their opinions on any and all issues, we invite our members and readers to donate to PlanetPOV to help out with our ongoing expenses of keeping The Planet orbiting the political universe as well as encouraging colleagues, friends and family to join the growing community here. If you appreciate the conscience and informed nature of the articles, comments and conversations you find here, please donate. If you enjoy the international rundown of what’s going on around the world on Morning Blog, please donate. If you enjoy Vox Populi and the new live chat room software we’ve added, please donate. If you enjoy the Weekend Music Thread that Kilgore Trout hosts, please donate. If you enjoy the irreverent humor in the comic and satirical articles posted here, please donate. We don’t make many requests during the year for donations, this is the first time we’ve done so this year so we do encourage all those in our community to pitch in even if they’ve donated in previous years. There are two ways to donate, you can make a one time donation or subscribe to make a $5 monthly contribution (just about the price of one coffee at Starbucks…and The Planet never makes you wait in line!). A big thanks to all of our members for helping us reach and celebrate our fifth anniversary! With a midterm election coming up fast this year and a Presidential election picking up steam next year, not to mention all the big stories happening in the U.S. and all around the world, there’s going to be a lot going on here at The Planet and your contributions will help make all that possible. So…here’s to the first five years of our remarkable community here…and to the next five! Cheers! Ad, something is wrong here. I havent’ gotten any email from replies I get.Had to visit the page again and only then I could read RSG’s response to me…….Peace. So happy to see you back EXFAN…It appears you have a lot going on in your life. Don’t let things become to much, always remember to take a bit of time to relax, come visit your friends here at the Planet. That always helps me clear the cobwebs from my brain, and gives me a better outlook. Living with someone who thinks they can beat the Casinos has to be stressful. I hope he actually wins big, or decides he’s wrong and gives it up. The latter would probably be better. Take care, we are always here for you if you need us. Dearest Monica, thanks for your kind words.Indeed it’s very stressful but, at least, he is facing he has a gambling addition and is frequenting AG. It was the worst hit on our bank account and I will not put up with it any more.Especially having his 20 years old son living with us and witnessing his downfall.Disgraceful.And my husband is a wonderful lawyer….and a fool. Glad you got every thing to work out!! No he can’t beat the casino’s. I Quit when you are ahead and take my wife to a fancy dinner! HI Tat’s yea that is probably true. OH i have no question of your strength and fortitude. Yes i gamble some, DeL also but we have strict limits and low get out point and do something else . I am very good at math and casino’s do not like that, i do know when to leave the table with winnings small enough not to notice and go to another or just wait a while. Well, since the Planet is my home, There is no question as to whether, or not, I contribute. Of course NOT! 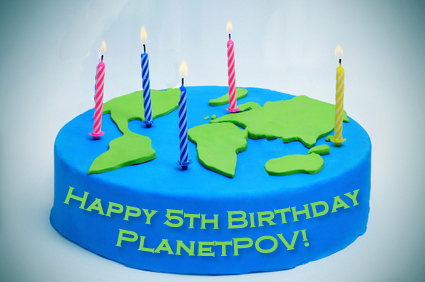 Happy 5th Birthday Planet POV ! I’ve enjoyed this site from the beginning and I happily donate. Keep up the great work! Cheers seehowtheyrun! So pleased to hear it, wonderful to have you here. Congrats to all at planet Pov. Thanks RSGMusic for the kind words and being a part of The Planet! HI Adlib thanks i like the site. I do nothing by credit card , can you give me a MAIL address ( old style that needs a stamp ) and i will donate some money. That was funny!BTW just got home and received a pic of her with President Clinton and Chelsea……donation time! Cheers James, thank you. And no problem, all members receive a free Hillary moment with their membership. I didn’t know I could donate or subscribe, but I’ve subscribed now. You are all doing an incredible job. I’m curious about the cofounders KQuark and Bito you mentioned. What happened to them? I am glad you are here gentle friend EXFANOFARIANA. Humanity has missed you. Thanks so much, ST. Your kind words and generosity mean a great deal to us. And the links Kalima provided will give you and others a glimpse of who KQuark and Bito were and what an impact they had here. I believe we should bring them, and all innocent beings, back gentle friend AdLib. And we have never won a war against it. Thank you for your contribution, it is much appreciated. We lost both Bito and KQ within a few months of each other last year due to long illnesses they had battled for years. This was our tribute to them, two of the kindest, passionate, caring and honest people we have had the honor of knowing and calling our friends. I am drowning gentle friend Kalima. I am so sorry, for all humanity. Thank you. I hope that the links helped to answer your question about who they were. Thanks for posting these links, Kalima. I always feel KQuark and Bito here, they put so much of themselves into The Planet. Five years and still going strong, a fine tribute to those wonderful guys. Hi AdLib, thought it was the best way to understand how much they both meant to our members through reading their comments. Yes, there are many times I feel that they are here with us, and it’s comforting. Happy birthday PPOV. It hardly seems that long! Hey GC, so true, kind of surprising and kind of amazing. Thank goodness we look exactly the same after 5 years…at least our avatars do! Hi GC, I know what you mean. It seems like just yesterday that AdLib, KQ and I were biting our nails, fastening our seat belts and waiting expectantly after launching The Planet. Who would have thought that so many wonderful people would have joined us to share our dream and their pov. We are humbled and forever grateful. It is too bad KQuark and Bito couldn’t be here to enjoy your 5th anniversary. Congratulations!!! Many happy returns! They are here, dear Monica…with their everlasting love and brightness……among our galaxy…. I believe you are correct EXFANOFARIANA. Thank you for reminding me. Thanks monicaangela! Agreed, KQuark and Bito had a lot to do with the PlanetPOV we all know, they are missed and always remembered. Thanks for the birthday wishes! We’re five years old…does that mean we start kindergarten now? I remember conversations with those two at HP, I miss their wisdom and humor. Kindergarten? Aren’t we gifted? I say, maybe we will probably be accelerated beyond Kinder. We carry them both in our hearts so they will never be forgotten, and feel their presence on every page. There is not a day goes by when I come to The Planet that I don’t think of them. They would be proud. They would, you guys in administration here are wonderful. I’m sure they would be proud of that, the tradition goes on. I’m sure you guys keep them in mind with every decision you make here. It is wonderful to have friends, and to be able to say those two were your friends is really saying a lot. We have all been blessed, those of us who had an opportunity to interact with them, but you guys who actually worked with them I feel were incredibly blessed. Yes we were lucky to have had a good relationship with them outside of The Planet. We laughed and cried together, and supported each other in good and bad times. They are a part of my life I will carry with me until it’s time for me to go. I loved them both. Happy Birthday to the Planet and to all Planeteers! Left you all a gift and I urge everyone to do what they can to support this terrific oasis of sanity, civility, and hilarity. Cheers Murph, very cool and very appreciated!!! We should have birthdays more often! Thanks Murph, both for your contribution and kind words. Much appreciated. Congrats on the 5 years Ad and Kalima. You folks are great and I am trying to figure out how I can get some of my money to you. I don’t use credit cards or a checkbook. I’ll figure some way soon. The Planet is like my second home. I love this place and the way you manage it. Cheers Nirek, thanks for all your support of The Planet! So glad you’re a part of the community here! Please feel free to email me about donating and we’ll figure it out. Thanks so much! Money orders? Does the Planet have a PO Box? As far as I know (no I’m not HC) we don’t, but this is not the first time, and AdLib has a way which I’m sure he will discuss in private with Nirek when the time comes that he wants to make a donation. Not a problem. I was half joking. Stamps would have been my next suggestion followed by bartering. Oh, ok, I was half asleep. We might go for chickens too. You don’t know how tough it can get in the tech room, KT. He needs all the help he can muster. Sometimes he’s there for days. Laying eggs I hope, for breakfast on my MB terrace. If we turf out most of AdLib’s half eaten pizza boxes, the piles of odd socks, cricket bats and spray cans of “Trollbegone”, we have plenty of room for them behind Curtain Number 3. Thank you, Nirek. Know we are happy to have you here, and for sharing your honest thoughts with us. As soon as AdLib and kes get here, maybe we can all have a slice of that cake. First dibs on Europe and Japan though. Kalima, thanks for saving me a piece of Planet cake, it’s out of this world!